We've talked a lot about how Microsoft managed to shoot Windows 10 (and consumer goodwill) squarely in the foot by refusing to seriously address OS privacy concerns, and by using malware-style tactics to try and force users on older versions of Windows to upgrade. 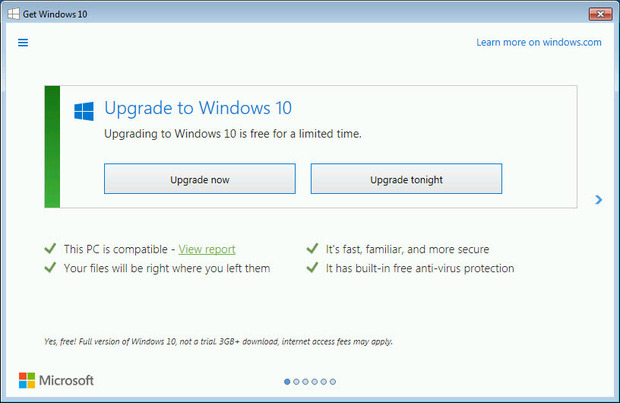 While Microsoft's decision to offer Windows 10 as a free upgrade to Windows 7 and Windows 8.1 made sense on its surface, the company repeatedly bungled the promotion by making the multi-gigabyte upgrade impossible to avoid, which was a huge problem for those on capped and metered broadband connections. But at times Microsoft made things even worse by engaging in behavior that would make even the lowest scumware peddlers proud. Like that time the Redmond-giant began pushing Windows 10 upgrade popups that pretended to let users close the popup dialogue by pressing X, only to have that begin the upgrade anyway against the user's wishes. Between this and the company's outright refusal to let users control how and when the operating system phoned home, Microsoft managed to take a relatively successful OS launch and turn it squarely on its head -- largely by ignoring some of the most basic principles of design, customer service, and public relations. "We know we want people to be running Windows 10 from a security perspective, but finding the right balance where you’re not stepping over the line of being too aggressive is something we tried and for a lot of the year I think we got it right, but there was one particular moment in particular where, you know, the red X in the dialog box which typically means you cancel didn’t mean cancel. And within a couple of hours of that hitting the world, with the listening systems we have we knew that we had gone too far and then, of course, it takes some time to roll out the update that changes that behavior. And those two weeks were pretty painful and clearly a lowlight for us. We learned a lot from it obviously." Except Microsoft didn't really "get it right," and users made that abundantly obvious. And whether Microsoft actually "learned a lot from it" really isn't clear, since a refusal to let users truly control how the OS works (whether it's preventing the OS from being quite so chatty or letting users dictate upgrade schedules on their own terms) has been somewhat of a recurring theme since launch. That "we know what's best for you" mentality has been bone-grafted to the company's DNA for some time, and we'll likely have to wait until Windows 11 to see if any lessons were actually learned. The silence about why it was burning so much data, constant scans for telemetry, no idea whats happening to their computer & MS deciding they know best and customers should have no options or information. That is the problem I've had with Windows 10, especially on my AMD A10 game system (with an external video card setup.) It runs Linux extremely fast, but I play Windows games, so I tend to dual boot it. Windows 10 is dog slow on the 3.0Ghz/16 GB RAM AMD A10 (a 2 year old computer) and there are times where I see the system 100% idle and nothing responds fast, and times when srvhost has the CPU pegged at 90% running appmodel or some other process. I finally got it to work flawlessly by killing the appmodel process, disabling a bunch of windows tasks, and turning off cortana (which was using 25% of the processor regardless to it being "off"). Windows 7 never had this problem. Even had to disable some of this stuff on a brand spanking new Intel laptop, because it would go off and start doing stuff in the background that wasn't necessary. If it wasn't for the game market still heavily invested in Windows, I'd have no Windows machines at all.